This is very convenient for those times I don’t have my 3D mouse available. For some reason I just can’t get into the habit of using F4 for orbiting in Inventor. Maybe it’s a throwback to my old anti-DOS days. Or more likely it’s because I use so many software packages on any given day that I don’t really remember the specific short cuts for each one. In any case the ViewCube is there in every software. I use it most often for flipping my viewing direction and then returning to the Home view. Pretty standard stuff. And it’s the same behavior across the software spectrum. 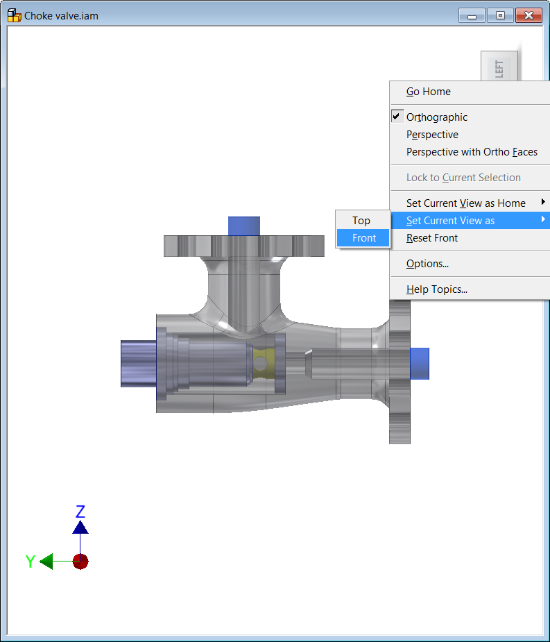 Here are the ViewCube options for Inventor and Showcase. They look pretty similar, don’t they? Honestly I’ve used this for several releases. I also have used the choice to change the definition of the Home view to a different isometric view by picking a different corner of the ViewCube and taking the “Set Current View as Home” option from the ViewCube’s right click menu. But recently I’ve realized that I had been short changing this function. I have always been annoyed by how the typical isometric view doesn’t do the best job of presenting components. This is especially true for rectangular shaped components. Vertical lines in the front and back seem to fall on top of each other in these views. So I tried using the Set Current View as Home (in Inventor) when the component wasn’t in an isometric orientation. And it worked! While this valve example isn’t very rectangular I still think the new home view is much easier to look at and gives a clearer picture of the design. Now I wish I had tried that a few years back. Changing the viewcube’s home view has to be done for every new part. I have solved this issue by changing the home view for the Template file to display, not the fixed distance view, but the fit to view-view. I have also placed an ilogic rule inside the template to load the home view on startup.